Convicted felon Collin (Daveed Diggs) is trying to stay on the straight and narrow with the end of his probation in sight. With only three days left, Collin witnesses a white police officer (Ethan Embry) shooting an innocent black man and is left haunted by the incident. Taking a look at how his own behaviour landed him in prison in the first place, Collin starts to question his long-time friendship with his short-fused colleague Miles (Rafael Casal) and he ponders the racism that is rife through his home state Oakland. 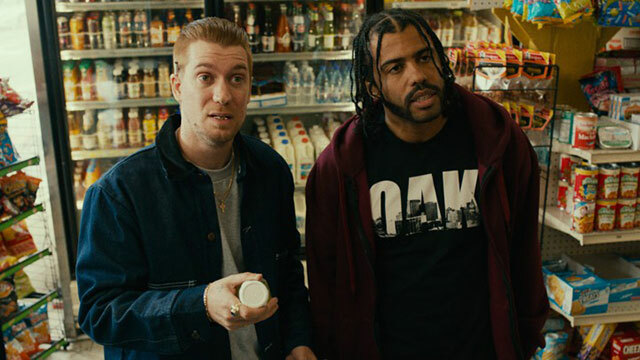 Blindspotting has become something of a sleeper hit in the US and given the current political climate in that country, it’s not really much of a surprise. Race relations in the US are something that the government have failed to deal with for years and the situation is one that continues to worsen. Rather than make a super gritty and hyper-realistic drama out of the issue, Blindspotting takes a different approach by using humour and juxtaposing that with shocking moments to make its point. Collin served time behind bars for an aggressive assault on a white man at a club. Even though Miles was as much a part of the assault as he was, it was only Collin who was convicted. The moment Collin sees Officer Molina gun down an innocent black man, he starts to unravel the unfair prejudice that exists among black people. He’s frightened to report what he saw, convinced that he’ll somehow be blamed and find himself back in prison. Miles meanwhile has no ability to modify or filter his behaviour, and shows no remorse for his part in the assault that landed Collin in prison. Instead he operates on a very short fuse, frequently blowing up and causing situations that could negatively impact Collin. Blindspotting unpacks some difficult issues and it tackles them in an engaging way. Surprisingly there’s a lot of humour in the film and the chemistry between Diggs and Casal is one of the strongest parts. The two wrote the screenplay and clearly they are able to bounce off one another creatively. One of the most interesting characters in the movie is Collin’s ex-girlfriend Val (Janina Gavankar), who works as a desk secretary at the removal firm that Collin and Miles work for. She’s Collin’s conscience and she’s the one that urges Collin to look at his relationship with Miles as the crux of his woes. Diggs and Casal give fantastic performances here. They are believable as best friends but each has very distinct traits. Digg’s Collin is a man who has seen the inside of a prison so his behaviour is modified and he’s overly aware of everything he does. Casal’s Miles doesn’t give two hoots about anyone else and is more concerned with posturing and posing. At one point the two friends have a conversation about using the ‘n’ word and it’s a very enlightening and powerful scene. There are a few issues with Blindspotting though. Miles isn’t really developed to the same extent as Collin and the two never really get to the bottom of their potentially toxic friendship. The final act, while necessary in terms of the story, feels a little too coincidental and I did find the parts where the actors rap their way through difficult situations a bit distracting. Overall thought Blindspotting is a timely look at what it means to be black in America and it paints a very scary picture. The film couldn’t have come at a more politically divisive time and it makes some astute observations and very valid points. Blindspotting will easily find a willing audience but it remains to be seen if the film reaches as wide an audience as it deserves to and should.